A solar eclipse occurs when the moon gets between the sun and Earth, casting a shadow on the Earth’s surface. This can happen only during a new moon when the sun and the moon are in conjunction as seen from Earth in an alignment referred to as syzygy. In a total eclipse, the disk of the sun is fully obscured by the moon, as seen from Earth. In partial and annular eclipses, only part of the sun is obscured. Anytime there is a total solar eclipse, there is a partial solar eclipse nearby, outside a rather narrow path of totality. The path of totality, and the approximate amount of partial eclipse over the lower 48 states. Courtesy NASA, click to see larger. Even if you’re not in the path of totality during 2017’s August 21 eclipse, where the total eclipse lasts just seconds to minutes, the partial eclipse — when the moon is covering just part of the sun — takes much, much longer (hours) over a much much wider area: you’ll even be able to see a partial eclipse from Hawaii, and every other state of the U.S., every province in Canada, to south of Central America. Hundreds of millions of people will be able to see something — but definitely read on to understand what you need to do to ensure you don’t risk permanent eye damage by looking at it wrong! More on that below. When you are in the path of totality during a solar eclipse — a narrow strip of land where the entire disk of the sun is covered by the disk of the moon — things happen pretty fast. Let’s start there. Those right in the middle of that strip, the path of totality (which is about 70 miles wide for this eclipse), see the total eclipse for the longest period. The longest-longest period of totality for this eclipse occurs from Missouri to southeast Tennessee, for 2 minutes and 40 seconds. As you know, the sun and the moon both “rise” in the east and set in the west. But the shadow of the moon during an eclipse starts in the west, and moves east at the speed of the moon’s orbital velocity minus the Earth’s rotational velocity. This eclipse starts in the morning on the west coast, and ends in the afternoon on the east coast. The path of totality starts in Madras, Ore., at 9:06 a.m., but totality doesn’t begin until 10:19 a.m.; totality ends at 10:21 a.m., and the eclipse ends there at 11:41 a.m. (all times local). The eclipse is last seen on land in Charleston, S.C., where it begins at 1:17 p.m., is in totality from 2:46 to 2:49 p.m., and ends at 4:09 p.m. Totality’s span across the U.S.: 94 minutes. In between, the path of totality runs through Idaho, Wyoming, Nebraska, Kansas, Missouri, Illinois, Kentucky, Tennessee, Georgia, and South Carolina. You have to be right in the middle of the path of totality to get the full length of totality. Along the edge, just 35 miles from the middle, you might only see a few seconds of totality. NASA has national and state maps where you can learn what you can see from where you are, and when. At what astronomers call first contact, the moon begins to cover the sun’s western limb (or the right side of the sun as we are observing from Earth). Until totality begins, you are going to need eye protection to directly view the eclipse. See below. Over the next hour, the moon will obscure more and more of the sun, as if eating away at it, creating a crescent of the sun. Stories passed down through native peoples worldwide have a similar theme of an animal eating the sun. Cherokee tell of a frog eating the sun, the Chinese blame a dragon, and in Scandinavia it’s the wolves that chase the sun through sky each day, who have finally caught it! Once about 80 percent of the sun is covered, about 15 minutes before totality, changes in your local environment will become noticeable. Ambient light levels are obviously lower, like at sunset, but the landscape takes on a blue-gray tone, very much unlike sunset. The reds of sunset aren’t there because the light isn’t traveling through any more atmosphere, especially with the 2017 total solar eclipse occurring so close to solar noon. As the moon continues to nibble away at the sun’s disk (aka the photosphere), this is a good time to look around you. Birds and other animals may become quiet, bedding down for the night, others may become anxious. Some plants and flowers may even close up because they sense it’s turning to night! Five minutes before totality, look to the western horizon: it will look as if a large thunderstorm is approaching, darkening significantly. If you are viewing from a hilltop, you may be able to see the edge of the darkness approaching. You are seeing the shadow of totality coming toward you! The temperature may drop noticeably. About 15 seconds before totality, with only the thinnest crescent of the sun remaining uncovered, the first evidence of the sun’s corona, or outer atmosphere, becomes visible. Latin for crown, the corona is irregularly shaped and only visible during totality, which is very exciting for astronomers to see firsthand. About 5-10 seconds before totality, the last rays of sunlight from the photosphere merge into a brilliant point of light — known as the Diamond Ring effect. If you can take a second to look down to the western horizon, you’ll see that shadow now really rushing toward you. 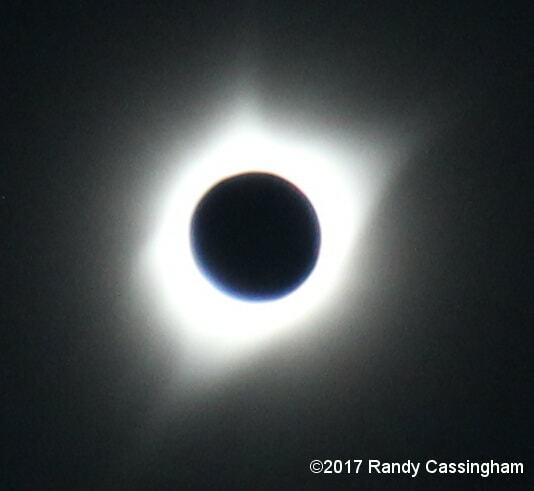 The Diamond Ring will then fade into what is known as Baily’s Beads, about 3 seconds before totality. Along the left side of the moon, sunlight breaks through the valleys and craters of the moon’s surface, forming points of light resembling dazzling jewels on a necklace. They’re named for Francis Baily, who first described the source of the phenomenon in 1836. Second contact is when totality begins, and you can safely remove your solar glasses from your eyes (and your camera or telescope). You’ll have just a few seconds look for the vivid red of the chromosphere, the gaseous layer below the corona and just above the photosphere. You may catch vibrant red prominences stretching into the corona. These prominences can be many times larger than Earth. If you miss it, you’ll have another chance on the right side of the moon, seconds before totality ends. Over the next seconds to about 2 minutes and 30 seconds, depending on where you are in the path of totality, observe the corona extending out many solar diameters. Each eclipse is different; sometimes the corona appears very round, sometimes it’s wider at the equator. This is also a good time to observe the sun’s magnetic influences in the form of loops and arcs — solar flares — tracing out those magnetic fields. Also look for planets and stars to appear. Venus and the bright star Regulus may appear right above the sun/moon. Also look for Mars about 8 degrees to the right. It’s been hidden for several weeks in the sun’s glare. Take note of the environment around you. How are animals reacting? How are your fellow observers reacting? Snap a photo of your friends and family, especially the younger kids with mouths agape. Take note of the temperature during totally. A 10-15 degree drop is pretty typical. Have a jacket ready so you don’t have to waste precious eclipse time finding it. As the right edge of the moon begins to brighten, it’s time to get those eclipse glasses back on: the end of totality (third contact) is seconds away, and the whole process reverses. Look for the shadow to speed away eastward, and also watch as nature pretty much returns to normal. Flowers open up and birds and other animals calm down. Last, fourth contact is when the eclipse is over. Not In that Tiny Strip? Even if you’re not in the path of totality (and it’s too late to plan a trip there if you don’t already have them made), there’s still a lot to see. It’s simply cool for the midday sun to suddenly be dimmed, for the temperature to suddenly drop, and the shadows change in bizarre ways — like in the attached photo (click to see larger) from an earlier partial solar eclipse. 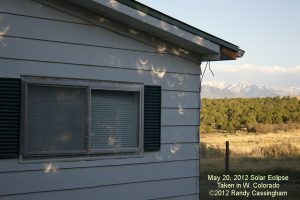 Use eclipse glasses or a pinhole camera to see the “bite” out of the sun, and watch how it changes over time. The moon being almost exactly at perigee (closest to Earth, making its angular diameter as large as possible). Earth being very near aphelion (furthest away from the sun in its elliptical orbit, making its angular diameter as small as possible). The midpoint of the eclipse being very close to the equator, where the orbital velocity is greatest. The vector of the eclipse path at the midpoint of the eclipse aligning with the vector of Earth’s rotation (i.e. not diagonal but due east). The midpoint of the eclipse being near the subsolar point (the part of Earth closest to the sun). The longest eclipse that has been calculated is the eclipse of July 16, 2186, which will have a maximum duration of 7 minutes and 4 seconds over northern Guyana. And If You Miss It in 2017? 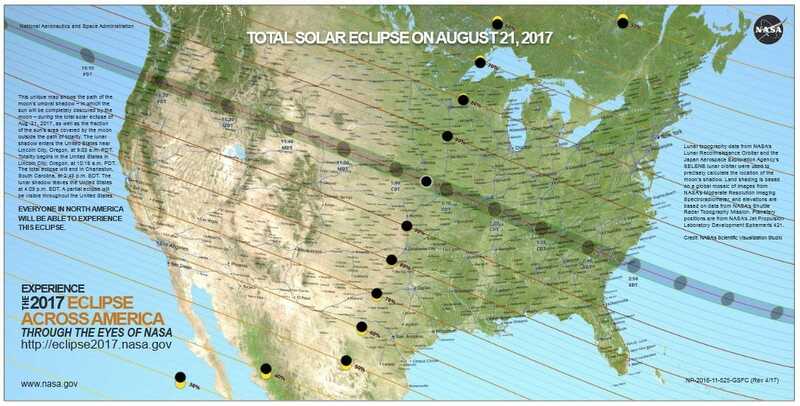 There’s another total solar eclipse coming to North America, running from Mexico through Texas, Arkansas, Missouri, Illinois, Kentucky, Indiana, Ohio, Pennsylvania, New York, northern Vermont and New Hampshire, and then the southern parts of Ontario, Quebec, New Brunswick, western Prince Edward Island, and Newfoundland, Canada. But that doesn’t happen until April 8, 2024. If you miss that one, the next one in the Continental United States won’t come until August 12, 2045. In between, though, there are other total solar eclipses that are visible in other parts of the globe. And that super-long one in Guyana in 2186, just 169 years away! 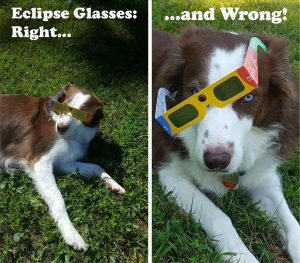 NEVER look directly at the unshielded sun, even during partial eclipse, without proper eye protection! Doing so can easily cause permanent damage to your eyes, up to and including blindness. Sunglasses definitely aren’t enough. 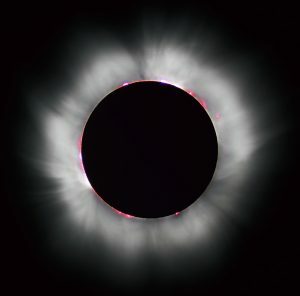 Only when you are in the path of totality, and during totality, when the sun’s disk is completely covered right after the Diamond Ring fades, can you safely take off eye protection and look directly at the corona, Baily’s Beads, and other phenomena during the eclipse. Other than that, you need eye protection. Rather than try to describe what sort of eye protection myself, I’ll refer you to the safe viewing guide jointly developed by NASA, the American Astronomical Society, the American Academy of Opthalmology, the American Academy of Optometry, and the National Science Foundation. That page is here. NASA’s 2017 Solar Eclipse information site is here. Kit and I went to western Wyoming, and found a great spot in the center of the path of totality — and on a bluff with a great view to the west so we could see the approaching shadow. All I can say about the experience of seeing a total solar eclipse: mind-boggling amazing. Drop-dead awesome. Electrifying. Watching the shadow come at us from the west was astounding, and when it was suddenly darker, we whipped around to see the “Diamond Ring” in the eastern sky. We didn’t see a lot of stars, but could see Sirius — and a very bright Venus. And a deeply black disc where the sun was supposed to be, surrounded by the sun’s corona. A total eclipse is pretty much an accident of celestial mechanics: there has to be a moon of an apparent size that’s larger than the sun, and everything has to be right to see it. I understand why my astronomy-crazed father saved money to travel, and saw (as far as I know) two of them: one in Baja California (Mexico) and one in Kenya. He’s been dead for almost 10 years now, and it’s stuff like this that helps keep that connection alive. I get it now, dad. Wow. Photo taken by me this morning (handheld DSLR, polarizing filter only). Click to see larger. Portions of this article were adapted — with permission — from “What to look for during a total solar eclipse” by Tony Rice, Solar System Ambassador from NASA’s Jet Propulsion Laboratory. The rest was written by Randy Cassingham, Solar System Ambassador from NASA’s Jet Propulsion Laboratory and the proprietor of this site. The photos of Rebel the dog are ©2017 Lauren Nicholson, Solar System Ambassador from NASA’s Jet Propulsion Laboratory and owner of Photography by Lauren, used with permission. I fly, and the avionics shop I use is in Casper. I talked with him. The Fly in reservations were at 5:30 am going back. My brother in law made telescope lenses he wants to go. I’m like good luck finding a ride and then think of the zoo trying to get out. If you live or work at the edge of the strip of totality, where the official NASA site says you should get a few seconds of totality, you should know that the actual strip of totality is closer to 69 miles wide. This is due to the size of the sun being slightly larger than the official size that NASA had to use for their map. NASA is recommending that people who love in those locations move about ten miles toward the center of the strip because at that edge, they might only get 99.9% of totality. Fortunately, I live in the strip, so if it’s a clear day, I’ll get about 2:17 of totality. Businesses and government agencies in this area are closing in order to have less traffic on our roads because we’re being warned that we will have more traffic here than we would get during a hurricane evacuation. Loved your story about the eclipse and your dad. The great photo was just bonus. That was *TOTALLY* awesome and beautiful. I’ve seen a partial eclipse before but had no idea just how *much* better the total one would be. The diamond ring was amazing to see and then the corona. Assuming I’m still around in 2024, I will definitely do whatever I can to see it. I was watching in NJ (near NYC), where we had about 70% coverage. I had eclipse glasses, and had a lot of fun sharing them with passersby. Since it wasn’t total here, there was plenty of time to look at the partially occluded sun. I got a lot of “Wow!” responses. I’ve heard similar stories from NYC friends. Impromptu sidewalk eclipse parties! I am planning to travel for the next one. Is there an aircraft fast enough (SR71A ?) to follow and film the total eclipse across the continent? It would have made a cool video, showing the sun/moon above and the terrain below for about an hour and a half. Like your dad, Randy, I drove to La Paz in 1991 with my wife and kids from Houston (“drive 1500 miles west to San Diego, hang a left, and drive another 1000 miles to the path of totality”) to witness the eclipse. I remember being embarrassingly inarticulate at the time of totality (which exceeded 6 minutes), and I only remember because I was taping everything on my VHS camera/recorder at the time! Words cannot describe what it feels like, and people who haven’t experienced it simply can’t comprehend the impact it has on your soul. This time we went to Lincoln, Nebraska, and got clouded out, seeing only snippets of the time between first and second contact. I am looking to redeem my reputation with my family by finding a better location with the clearest possible skies for the 2024 eclipse!